Candidates who fulfill the eligibility criteria of the IGNOU B.Ed. programme advertised by the open varsity can apply online through the official website, ignou.ac.in. 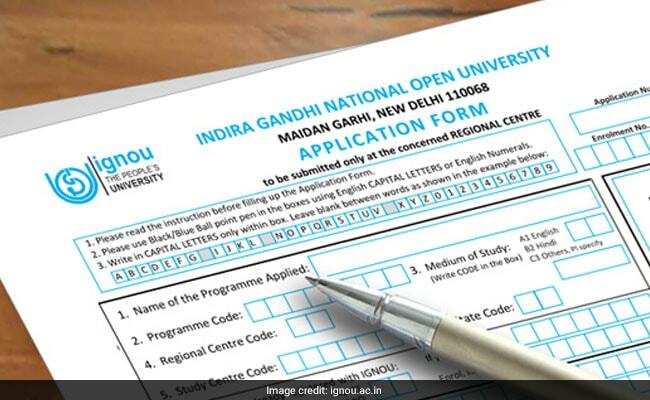 IGNOU or Indira Gandhi National Open University will be closing the online application process for admission to B.Ed. programme soon. The Bachelor of Education or B.Ed online application process for admission to the course offered through an entrance test will be conducted till November 15, 2018. Candidates who fulfill the eligibility criteria of the IGNOU B.Ed. programme advertised by the open varsity can apply online through the official website, ignou.ac.in. Application form, registration, eligibility and other major details on the IGNOU B.Ed programe can be found on the official website. Students who fulfill the eligibility criteria mentioned above can apply online through IGNOU's official website. Step 1: The first step to fill up the Online Admission form is to register yourself. For this please click on the button "REGISTER YOURSELF" that appears on the applicant login area. Step 2: Click on "Login" button given on the homepage of the online form. Step 3: Fill the 9 sections from the application form. You have to fill up each section carefully one by one using the "Next" button after filling up and saving the each section. Ninth section is the fee payment gateway. Once your payment is successful, the application process will be completed. You will receive an email as well as SMS, confirming the successful submission of your form. You will receive further information about confirmation of your eligibility for entrance or about discrepancies (if any), in your form. Once the discrepancies are addressed by you, you will be provisionally allowed to download your entrance test admit card and appear in the entrance test, but if any discrepancy or wrong information is found in your application form at a later stage, your application will be rejected and you will not be entitled to refund of any fee paid by you to the university. There is no need to send any hard copy/downloaded copy to any Regional center or IGNOU Head quarters. You can save, download and keep the copy with you for future reference. Applicant must have at least fifty percent marks either in the Bachelor's Degree and/or in the Master's Degree in Sciences/ Social Sciences/Commerce/Humanity. Applicants with Bachelor's in Engineering or Technology with specialization in Science and Mathematics should have 55% marks or any other qualification equivalent thereto. Also applicant must be a trained in-service teachers in elementary education or should have completed a NCTE recognized teacher education programme through Face-to-Face mode. The session for B.Ed. programme will start in January. Course fee is Rs. 50,000 for the entire programme. The B.Ed. Entrance Test date will be announced in due course of time by IGNOU.